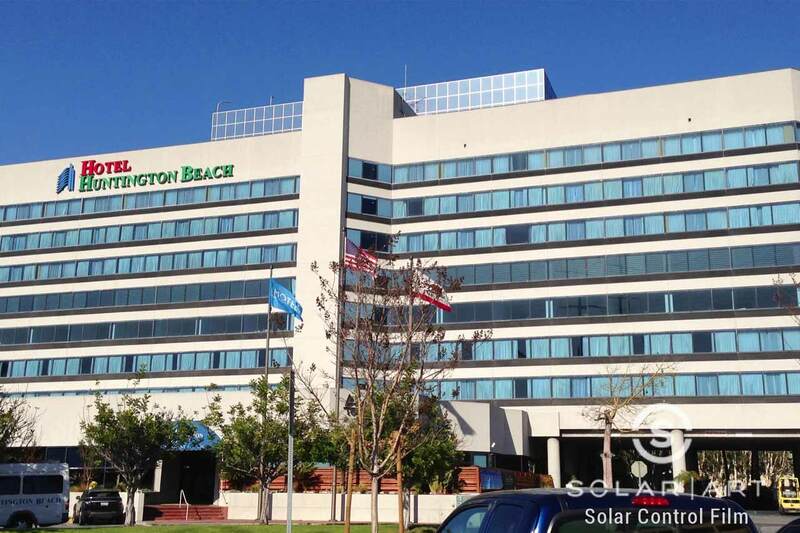 Solar Art installed reflective window film to the Hotel Huntington Beach! This customer was looking to create privacy for guests as well as reduce heat that enters the hotel to increase the comfort of the customers. Being in Southern California, it gets really hot during most months of the year and it can make rooms really stuffy and uncomfortable. They worked with our sales representative and decided Llumar Reflective Silver 20 was the best window film option for them. They installed this reflective film on windows all throughout the hotel to give it a clean and uniform look. As you can tell from the before photo when there is no reflective window film installed, you can clearly see which rooms have their blinds up and which ones don’t. Installing reflective tint makes it so you cannot tell whose blinds are up or down. It creates a uniform look so the entire building looks the same no matter the time of day. Creating a uniform look makes the building look well kept and modern. Especially in the hospitality field, curb appeal can be the deciding factor on whether or not a customer decides to stay at your hotel or not. Llumar reflective film creates privacy when it's installed. When the film is applied to windows, it looks like a mirrored film or a one way window film. Guests who are inside of the hotel or inside of their room still have full ability to see out of the windows. It won’t block views like blackout window film or frosted window film. However, people on the outside of the hotel do not have the ability to see in. Reflective window film was a great option for this hotel because being in Huntington Beach, there are beautiful ocean views that can be seen from the hotel rooms. Like other solar film, anti graffiti film and security window film, reflective window film and dual reflective film protect against 99% of UVA and UVB rays. Reflective window tint is a heat blocking window film, which means it can block up to 75% of heat that enters the building, making the rooms much more comfortable and enjoyable for guests. On top of privacy and heat rejection, reflective tint also reduces glare. TV glare can be extremely annoying and uncomfortable for guests who are trying to relax. 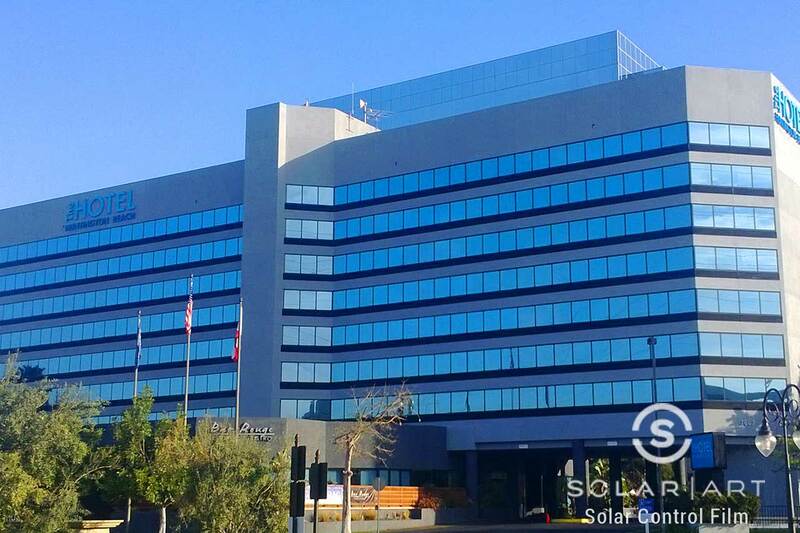 Solar Art has installed reflective film to both commercial and residential settings. Reflective film works great for storefronts and private offices that get really hot. Reflective window film also is great if you are trying to reduce heat in your house and create privacy from neighbors! Contact us directly to talk with us about solar film! Reflective window film greatly reduces the amount of heat that enters a space. It also protects against UVA and UVB rays and increases privacy. Reflective window tint works great in both residential and commercial settings. Contact us today for free quote!